Look what I found this cute little thing in New Straits Times. IT’S LIKE: A toaster that uses radio waves to toast your bread. Q: Wow, that’s a very retro-looking radio you have. A: Cool huh? And get this: it’s not just a radio. It also makes toast. A: Yes. 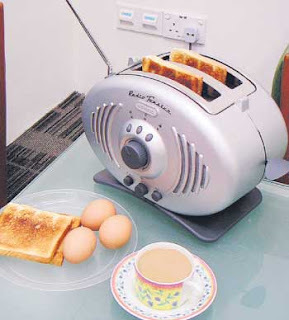 In fact, it uses radio waves to make toast! Q: All right, now you’re scaring me. A: Kidding! This appliance is actually a toaster with a built-in FM radio — two things commonly found in the kitchen. So with this combo product, there is no need for two separate appliances anymore in the kitchen. Q: Cool. Is it easy to use? A: Yes, it’s pretty straightforward as there are not that many buttons to push. Q: Let me guess: this huge knob in front is for volume control? A: Err, no. That’s actually the browning control for the toast. Q: Oh my, I could’ve burnt my toast while attempting to increase the volume of the radio. A: I forgot to tell you: you need to read the manual the first time you use it. The controls may not be what you think they are. The radio toaster has confusing icons. See the button labelled with what looks like a burnt toast? A: It’s actually for heating. The other button on the left, the one with a snowflake icon, is the button for making toast. A: And the button in the centre is for ejecting the toast manually. Q: So, which are the buttons for radio then? A: They’re all located on the lower part of appliance. The small knob is for volume control and to its left is the station search button. You have to keep pushing the button until you can hear what sounds like your favourite station. There’s no other way. Q: This is such a funny-looking contraption but in a good way. Ariete should’ve included another knob. Q: One that doesn’t really do anything. You can play with it while waiting for your toast. A: Yeah, and label it with a picture of an alien so you can pretend as though you’re trying to make contact with Mars.